Space Case is fast. Really, really fast. His speed is the only reason he hasn't been blown out of the sky, because his malfunctioning mind is only slightly more complex than an average rock. He believes his survival is due to the glyphs etched on his armor, but really, it's just hard to hit a target as quick as him. Prelude: Space Case is a repaint, along with a new head sculpt, of HftD Terradive, so this review will focus on the differences between the figures. Robot Mode: Space Case here is supposed to be a homage to G2 Space Case, so he got both a new paint job and a new head. Let’s start with the head. First off, it looks nothing like the head of G2 Space Case, neither in shape nor in colour. And similarities aside, it doesn’t look too good overall, at least in my opinion. Not sure why they didn’t go with something more similar to his G2 noggin’, but that’s neither here nor there. On to the paint job. 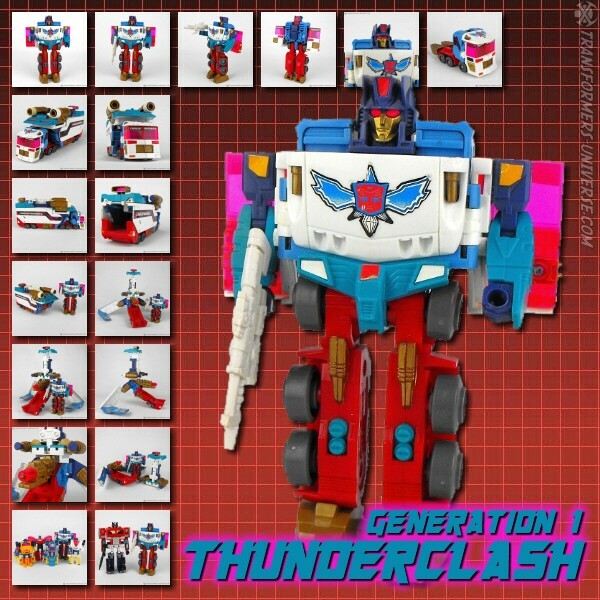 G2 Space Case was mostly white with red thighs and upper arms, as well as a black-and-blue dishtowel pattern on his chest. DOTM Space Case, on the other hand, is all over the place colour-wise. Most of him is a slightly translucent blue with red, white and black highlights in odd places. While I do like his overall look, there is no particular resemblance to G2 Space Case to be found here, either. As for the rest, well, it’s still a very nice robot with a great weapon (the spear) and nothing worth complaining about in terms of design or engineering. I would have wished for a more G2-accurate paint job and head, though. Alternate Mode: In vehicle mode the resemblance to G2 Space Case is a lot closer, if only because the two robots transform into the same type of aircraft, a Sukhoi Su-47 with forward-swept wings. That’s where the resemblance ends, though, because while G2 Space Case was mostly white and red with the aforementioned black-and-blue dishtowel pattern on the cockpit and wings, DOTM Space Case is mostly a slightly translucent blue. Okay, they both have a yellow-tinted cockpit, too, but that’s it. On the positive side, though, Space Case looks far less like he dropped into a paint bucket in this mode. The blue looks good on the jet, the various glyphs and symbols don’t seem out of place and I personally like this type of jet very much anyway. So in direct comparison with the yellow-orange Terradive, Space Case actually looks better here in my personal opinion. So thumbs up for the alternate mode. Remarks: Space Case appeared in several Movie tie-in comic books, but not in the actual Dark of the Moon feature film. He was portrayed as a rather dim-witted minion, nothing more, but did manage to trap Bumblebee in a cave-in, which gains him quite a few sympathy points from me. Available exclusively at Target, Space Case here was brought to Germany by my good friend James aka Caked-Up. Truth to tell I was a bit disappointed in this figure, mostly because the resemblance to G2 Space Case is miniscule at best - pretty much restricted to the type of jet they both transform into - but overall it’s still a good mold, even though Terradive has the superior head sculpt and overall paint job. Still, if you can’t get your hands on a Terradive, Space Case is a good alternative. Far from a must-have, but a nice toy.